Christon Cafe is high up in a very large building not far from Shinjuku Station. 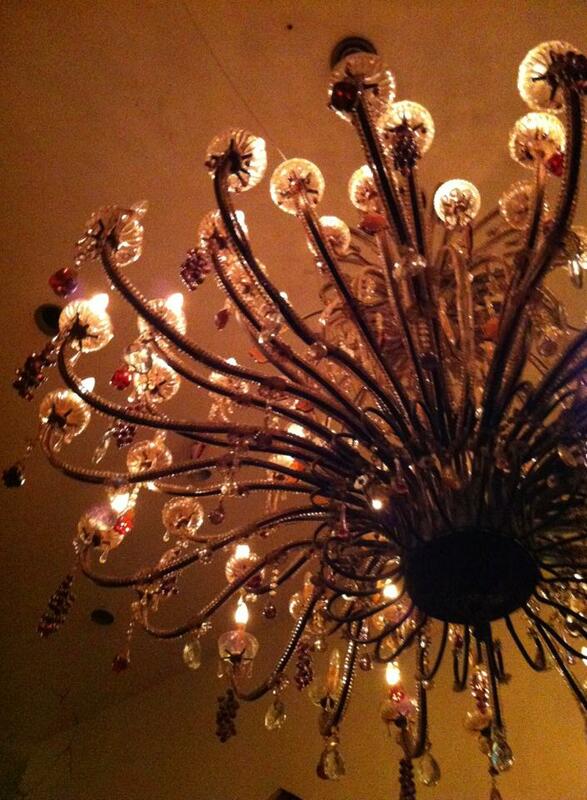 Once you exit the lift and get into the restaurant, the first thing you’ll notice is the very high ceilings. Then you’ll notice the decor: religious pieces from statues to alters all around the place, and enormous chandeliers on the ceiling. There are not as many artifacts as you might expect, but I was impressed by the size of the chandelier above where we were seated. Why the church theme? I’m not sure, but I think it’s partly for the novelty factor, and perhaps because of the kind of clubs and events that are held in the venue. Japan is not a particularly religious place, so a church themed restaurant isn’t going to bother too many locals. According to this Guardian article, the decor includes antique religious pieces from South America. However, I have not been able to find any information to back this up. 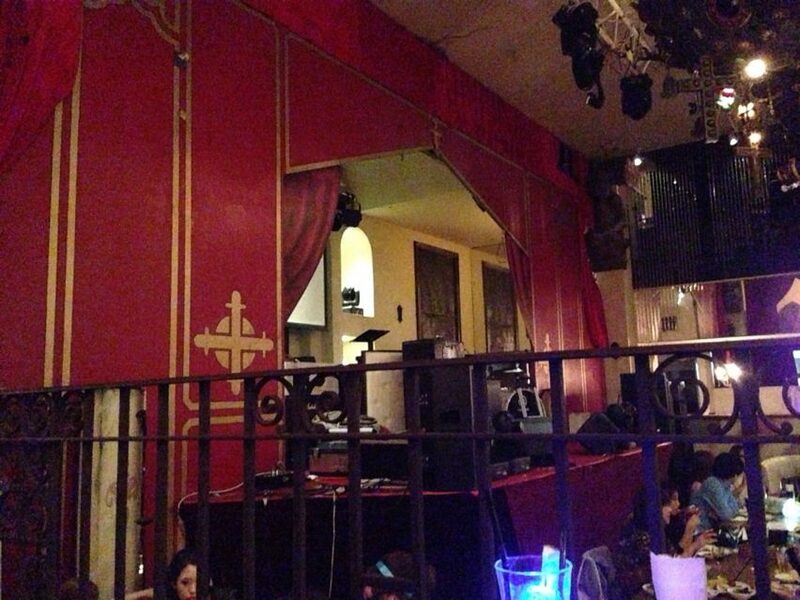 The stage where bands perform when Christon Cafe turns into a dance club and gig venue. The drinks were somewhere between okay and average. 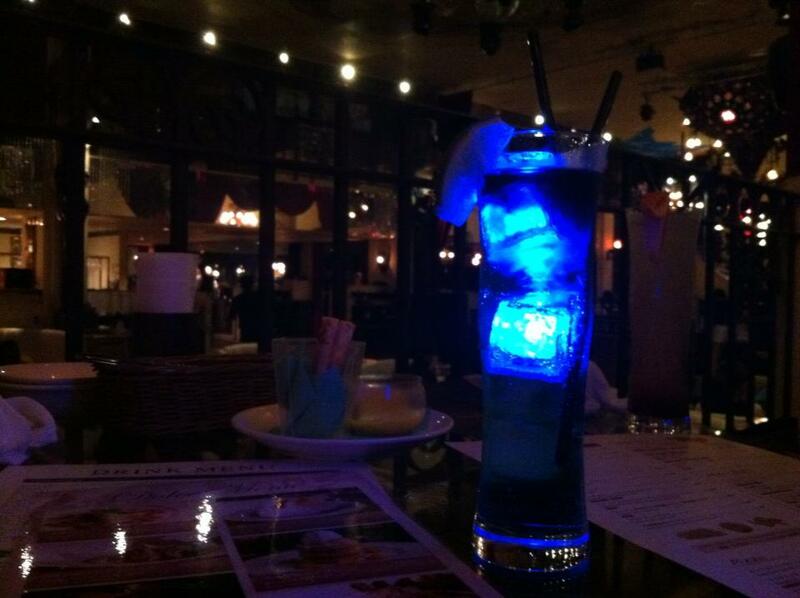 I ordered a drink that had glowing ice-cubes in it (basically plastic LED lights floating around). A lot of people were drinking it so I had hoped its popularity meant it would be good. I can’t remember what it was, other than that it basically tasted like an ordinary mixed drink rather than a cocktail. 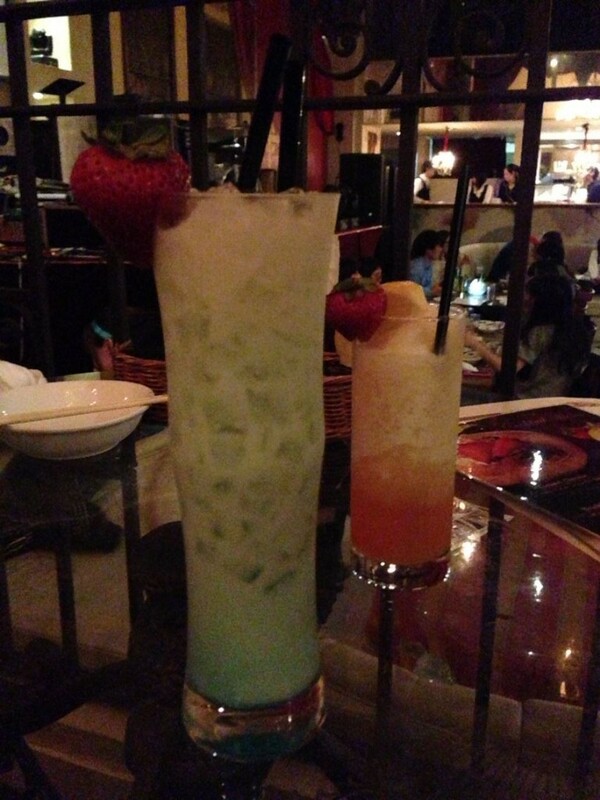 Our second round of cocktails included one called Fujiyama and another called Angel Dust. Again, they were fairly average. 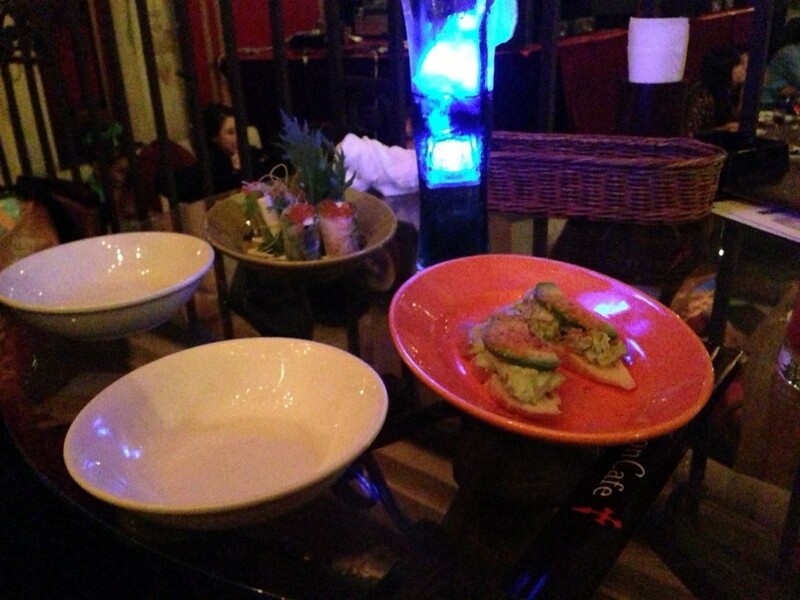 We ordered two entrees: bruschetta with avocado and tuna, and salmon and cream cheese rolls. The bruschetta was nice enough, and I would highly recommend the salmon and cream cheese rolls. They were the highlight of the meal. For mains, I had roast beef with gravy (I don’t have a photo) and my partner had grilled salmon and mozzarella (pictured above). It was okay, but nothing to write home about. We did find the service to be extremely slow. We had to ask them at least once to ensure that they hadn’t forgotten our food, and it wasn’t particularly busy when we ate there. Ice-cream brûlée dessert. I think this is basically a fancy way of saying, “We couldn’t be bothered making fresh brûlée, so we made a whole lot and froze it”. 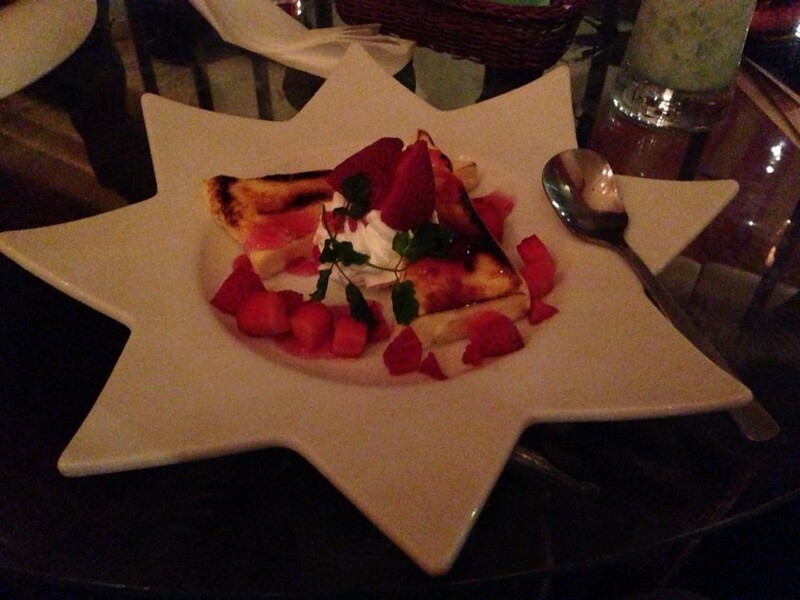 My recommendation would be to skip the dessert and get a parfait somewhere else (Takano Fruits is very good, and not far from Christon Cafe). I couldn’t honestly refer to this venue as any of the things that I have seen it described as (including but not limited to a whacky theme cafe, Tokyo’s most unique restaurant, a Gothic restaurant, a Christian theme restaurant, a religious theme cafe or a church themed restaurant), and I’m not going to pretend that I think that it’s any one of these things for the purpose of driving readers to my blog (this would defeat the purpose, wouldn’t it?). 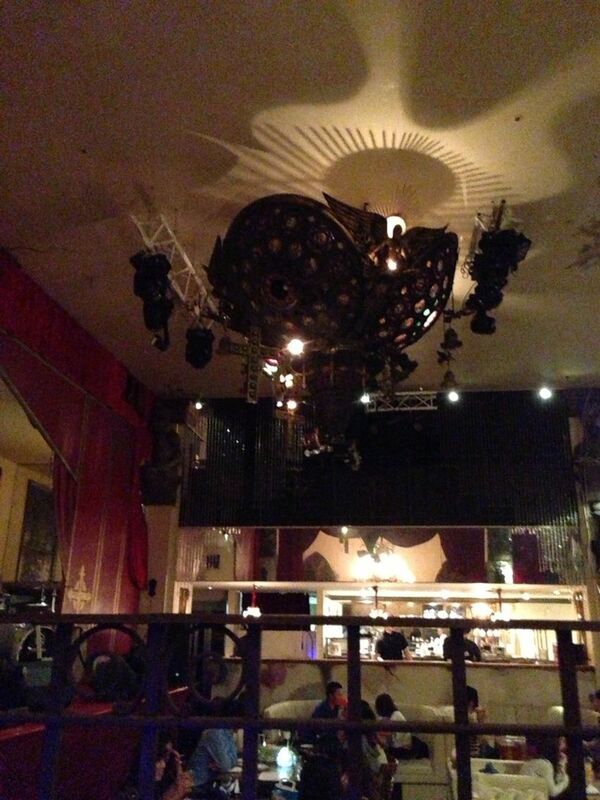 To me, it’s just a venue that doubles as a restaurant and a dance club, with a few Catholic artifacts here and there. The world seems to have an increasing interest “weird theme restaurants” and the only way that I can see that Christon Cafe achieves this is not for the reasons you might expect. The idea of a Christian, Catholic, religious or church-related restaurant isn’t the weird part. What strikes me as the strangest thing is that they splashed a few religious items around the place – an alter here, a statue of Mary there – and left it at that. Sure, some items on the menu have names that play on Christian themes, but they could have done so much more if they wanted to create a genuinely weird and/or themed restaurant. I didn’t get the ‘church’ feel or the religious thing. It just struck me as half-arsed, overpriced and a bit average. Perhaps my expectations were too high. I don’t know. I really wanted to like Christon Cafe place so much more than this, but it just didn’t live up to my expectations in any way. 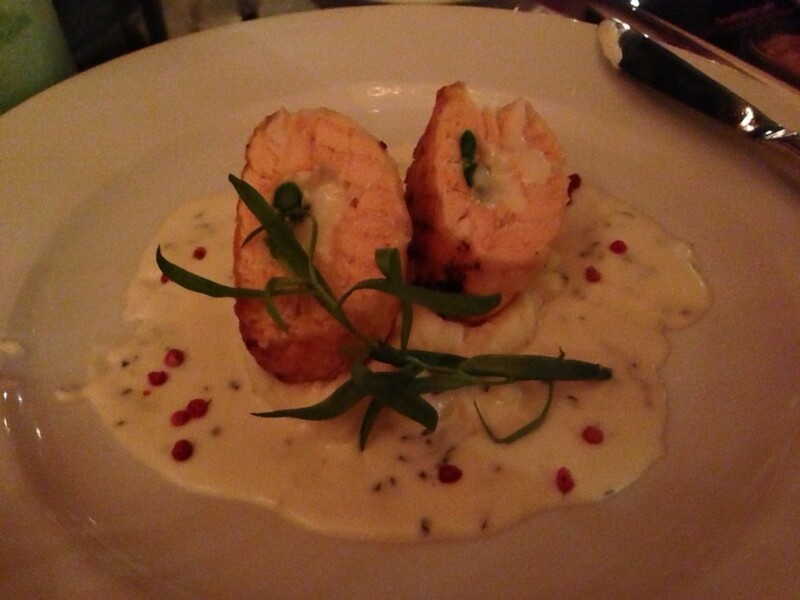 Except perhaps the salmon and cream cheese rolls that we ordered as an entree – those were delicious. Diamond Dining – which is responsible for Christon Cafe – runs a whole list of restaurants, including the well known Vampire Cafe and the chain of Alice in Wonderland restaurants. The Vampire Cafe is a stronger example of theme restaurant, and the good news is that they sell the same salmon and cream cheese rolls! 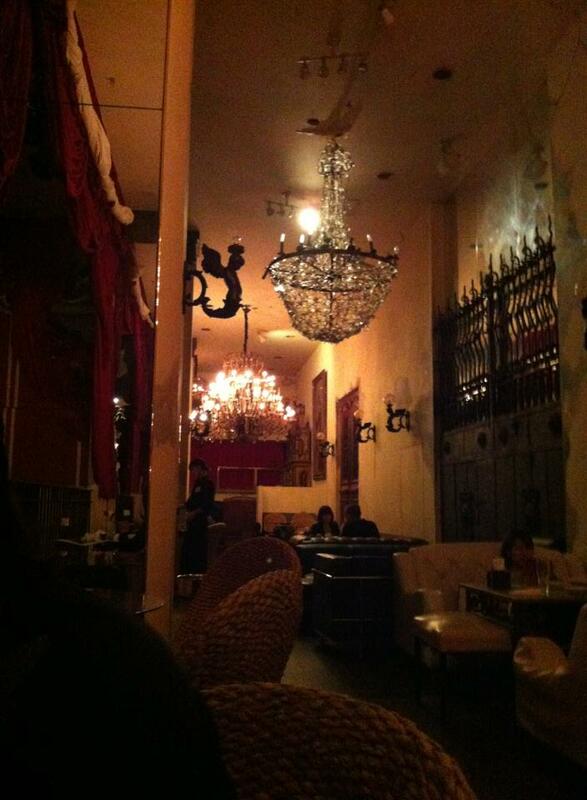 I’ll be writing about the Vampire Cafe in my next post, so stay tuned for that. Note: Christon Cafe is a smoking venue, so if you are asthmatic and/or prefer to avoid cigarette smoke, keep this in mind. Google Maps (above) provides the blue dotted line. I’ve added a purple line, which is the route that I took. It begins similar to Google’s version, so follow this to begin with. You’ll notice that I turn off to the right. 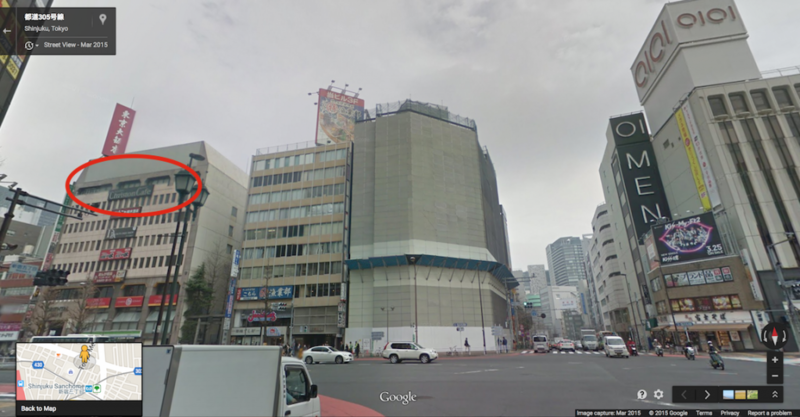 This will take you past a big Uniqlo store, and when you get to the big intersection, you’ll see the Isetan building on the left (the first large purple square on the above map). Cross the road toward Isetan and walk past it. Keep going and you’ll soon see the Marui Men’s (the sign says OIOI MEN) in the distance (this is the second large purple square on my map). 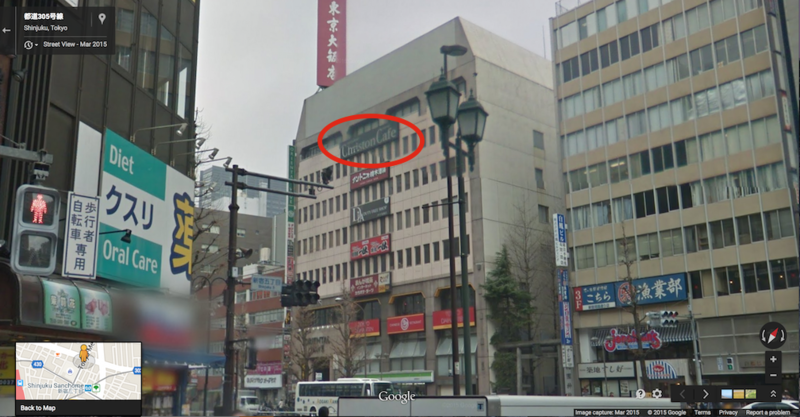 When you reach the intersection right before OIOI MEN, this is where you need to be – the building that Christon Cafe is in will be ahead on your left (see the red circle in the above photo). Turn left and cross at the intersection so that you’re heading toward the above building. 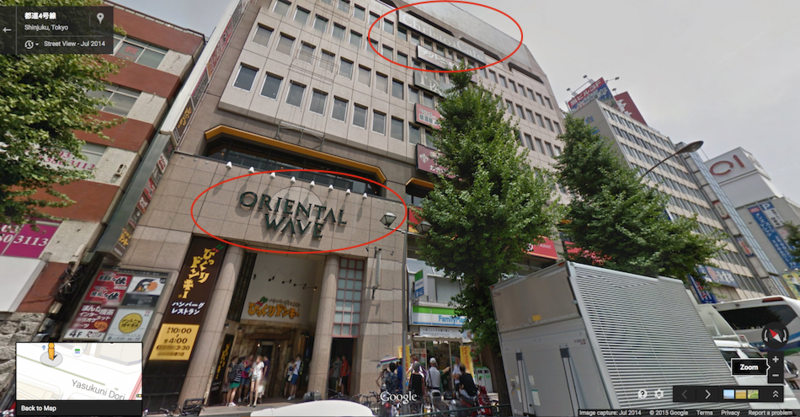 The building is called Oriental Wave. That’s the entrance in the above picture. Walk through there and catch the lift (elevator, for my US readers) to the 8th floor.